Run Time: 121 min. Rated: PG (Canada) PG-13 (MPAA) for intense sequences of sci-fi violence and action, and for some language. Unlikely Heroes Want to do Better? When it comes to MARVEL it looks like movie-goers are "hooked on a feeling" and the studio’s big gamble bringing the cult comic book Guardians of the Galaxy to the silver screen has paid off.With an opening weekend that dwarfed recent offerings MARVEL proves again it is the studio to watch. Add to that the success of its film Captain America: The Winters Soliderthis past March and it's easy to see that MARVEL has won the hearts and minds of its key audience. Starting with Iron Man (2008) MARVEL gives its audience scenes during and after the film credits that set up future adventures or give an extra tantalizing peak into the MARVEL universe. In Guardians of the Galaxy (2014) director James Gunn weaves MARVEL’s meta-narrative post-credit details into the back bone of his story. The producers first introduced Guardians of the Galaxy’s uber-villain Thanos in a post- credit scene following the hugely successful Avengers Assemble (2012). Gunn likewise incorporates a criminal middle-man named The Collector (Benicio Del Toro) who was introduced in a similar way at the very end of Thor: The Dark World(2013). For casual viewers this doesn't mean much, but for viewers deeply invested in the whole MARVEL universe and the interconnectedness of the studio’s films it means a great deal. For instance, these viewers are eagerly anticipating MARVEL’s "Infinity Gauntlet" storyline because each movie, while needing to convincingly stand alone, also needs to be neatly linked into a bigger story. For Christian viewers it might be handy to think of this in terms of the unfolding narrative of salvation history woven into the books of the Old Testament. Each book stands on its own, like Ruth or Esther, or is part of a series of stories like Joshua, Judges, 1st and 2nd Samuel and 1st and 2nd Kings, but within each book are details and plot points that, when viewed as a whole, reveal a picture of what is to come in Christ Jesus. Guardians of the Galaxyis the story of Peter Quill, a young boy who on the day of his mother's death in 1988 is abducted by space pirates and raised as a thief in a distant corner of the galaxy. 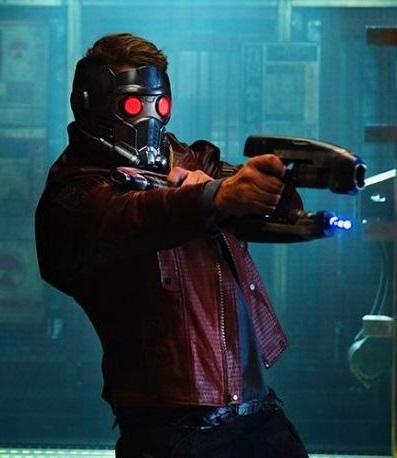 The womanizing, self-aggrandizing adult Quill (Chris Pratt) prefers to go by the alias Star-Lord. He unwittingly becomes the centre of an intergalactic power struggle when a mysterious object called The Orb comes into his possession. Wanted both by the alien space pirate who abducted him from earth as a child and by an opportunistic interstellar genocidal warlord Ronan the Accuser (Lee Pace), Quill finds himself in the company of a motley crew of mercenaries. 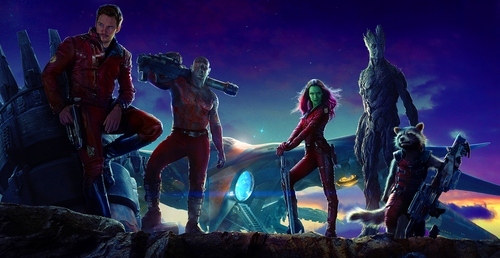 This rogues’ gallery of troublemakers include a talking racoon called Rocket (Bradley Cooper); his accomplice, a tree named Groot (Vin Diesel); the assassin, Gamora (Zoe Saldana); and the very literal-minded brute, Drax (Dave Bautista). Apart from the enigmatic Groot, each comes into the narrative with their own axe to grind and as the story unfolds they transition from being Quill's adversaries into his most fierce defenders and friends, eventually becoming the Guardians of the Galaxy. Rocket asks, "Why would you want to save the galaxy?" Quill answers, "Because I'm one of the idiots who lives in it!" As often happens in this genre of film the hero has to decide if he's going to risk his life to save others. In Guardians of the Galaxy this group of misfits-turned-heroes have to make the same kind of choice. In some super hero films this is an “in the moment” choice, not so in Guardians of the Galaxy.In this film there is a specific scene in which the central characters decide to face death, to die rather than run away like they've done all their lives. As they talk this over the promise of life after death emerges. The metaphorically-challenged Drax anticipates a happy reunion with his wife and daughters who were murdered by the merciless Ronan the Accuser. This will remind Christian viewers of their own trust in eternal life and in the happy reunion they will experience with those who have departed in the faith. King David, at the death of his son with Bathsheba, expresses this sentiment when he says, "But now he is dead. Why should I fast? Can I bring him back again? I shall go to him, but he will not return to me.” King David trusted that the LORD would make this reunion possible and this is a key difference between the Christian faith and what is presented in Guardians of the Galaxy. In the movie there is no explicit explanation as to why such a reunion would happen. Ultimately, Scripture reveals that this hoped-for reunion happens because of Jesus. Christians trust that it is the grace of God that links them to Christ Jesus and, while writing about baptism, Saint Paul teaches that, "if we have died with Christ, we believe that we will also live with Him." The alien Drax would be very happy with the Christian teaching of the resurrection of the dead and the life of the world to come because it is real and not simply metaphorical. While Quill and his fellow Guardians of the Galaxy are generally crass and reckless they also display great courage when it matters most. The character of Quill is a rogue—a lot like Han Solo from the original Star Warstrilogy (1977 - 1983) or Indiana Jones from Raiders of the Lost Ark (1981), and there is a reason for this. With Guardians of the GalaxyGunn and MARVEL wanted to capture the fun and high adventure of those films and import it into their project. In many ways they are successful. While the villains are cruel and the stakes are high, there is nothing dour about this film, no dreary handwringing or long faces and, while the heroes are honest about what big losers they are, they still manage to shine. Quill and his fellow Guardians are not good moral role models, however when they need to be, they are honest about their failings and want to do better. In this film they could be considered struggling role models of repentance. If comic book movies are not appealing then skip this film. But if they are, Guardians of the Galaxy will provide an epic and energetic visually splashy space-opera romp—just the thing to wake up audiences during this sleepy summer at the box office.